m a i s o n - o b j e t. c o m 43 MAISON&OBJET AMER ICAS pROfIlES fIvE CREATORS whO wIll ShARE ThEIR INduSTRy kNOwlEdgE AT ThIS yEAR'S fAIR duR INg ThE INTER IOR dESIgN & lIfEST ylE SuMMIT. 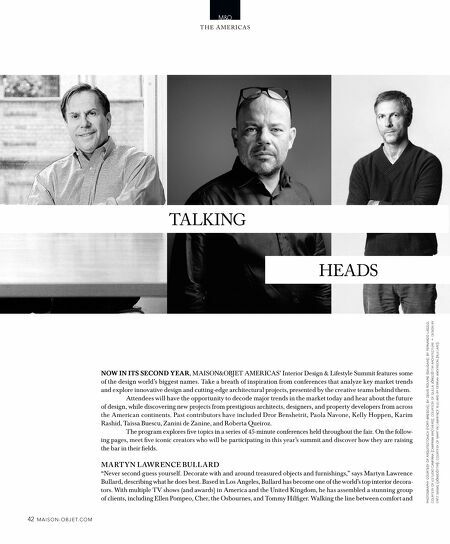 Summit Talks: This year's Interior Design & Lifestyle Summit includes conversations with ( from left) Bernardo Fort-Brescia, Thierry Gaugain, Humberto and Fernando Campana, Gulla Jónsdóttir, and Martyn Lawrence Bullard. sophistication, he approaches each space with fresh eyes, creating exemplary individualized interiors for his clients. Online buyers can purchase everything from pillows, throws, and decorative accents to his newly published book, Live, Love & Decorate. "I love to mix table settings," he says. "I believe they should show your personality and honor your guests with the effort put into their creation." Bullard's scrupulous attention to detail makes him the celebrated designer he is today. How has your past shaped your professional present? My childhood collecting bric-a-brac and then selling it at Saturday flea-market stalls gave me the knowledge of style, period, and decorative trends that today has become the backbone of my design library. I pull from this knowledge in almost every aspect of my work. The hands-on learning in those markets gave me real passion, a sense of worldliness, and also fueled my signature eclectic style. How does where you call home inspire your creative practice? Los Angeles is now my home, and the weather here has really inspired my design direction. To awake every day with the sun shining through the window definitely adds energy to my creative mind. The casual flavor of the California lifestyle also informs my interiors, leading me to understand that comfort is the first and most important luxury in modern-day interiors.